Hello minions and cohorts! This month's tournament is going to be a swiss style [with a twist!] Preliminaries 2v2 tournament with Single Elimination Bo3 finals! As a result of the experience acquired in the Renegade tournament, we're going to make a few changes. 1. You MUST sign-in before the tournament starts. Sign-ins begin 17:00 UTC. Team missing one or two players will require a sub to be picked out by 17:59 or they'll be dropped. To sign in, either send "_Shaman: sign in" in #ZKTourney or by PMing me. Basically, get my attention. This will help me with attendance and get games going faster than last time. 3. You are allowed to sign up solo. You should find a partner during signups or offer subbing during sign up period. Ravaged v2 -> Glacies would swap out Ravaged for glacies. Ravaged v2 -> ??? would swap ravaged out for a random map. +Icy Run v2 would add Icy Run v2 to the replacement pool. If a map has a vote for two different replacements, then the one with the highest yes vote count will take place over the other. Votes will be open until the day before the tournament. Only teams with two people may make modifications to the map pool and individuals may vote on signup. - Must be supported or higher. - Must not be speed metal or chicken. - Must be a team map. No FFA maps. - Cannot be bigger than 20x20. - Cannot be Gecko Island or CCR. 5. You may not perform any action that would make your partner be unable to play. 6. Signups close at 17:50 UTC, day of tournament. 7. During the Bo3 Finals, the loser of the starter match may pick the next map from the replacement pool. Reserved for casts / winners / matches. Can we get a formula to get accurate WHR. One issue is some players near never play on casual or competitive... so sometimes choosing only can get bad results, also averaging them u also get very sk(r)ewed results. Im not sure how to remedy this, a simple formula of some sort? edit: average works well for most people, but a few exceptions throwing rather good players into dodgy result. idea: if cas\comp whr difference > 300 then remove no more than 150 from biggest score. This simply stop a good WHR on a single ladder being dragged too far down by shocking WHR on the other. I've added a formula for right now. I'll see what kind of results we get from this as teams sign up. "The WHR cap for this tournament is 4550." I've always done soft caps. 4500 is a soft cap. It's an ideal thing to be below this. But I accept things slightly higher in case two people really want to play together and it won't split teams. I still discourage going over this. 4550 is a hard cap. I won't accept teams over this. * Teams will be paired with other teams of similar score based on who finished first. For instance, if a team has 1 win, they will be paired with the next team that has 1 win. * Teams can face each other multiple times. This will allow semi-asynchronous matches to occur at the cost of some extra management. hey guys, i was talking to other players and wonder if it's possible to change it from saturday to sunday. u see a lot of us have things on saturday and can't be part of it. but the majority do have sunday more open. so more players could join ;D please. Sept 29th is free for me, so I should be able to cast live. It's also at my normal stream time! 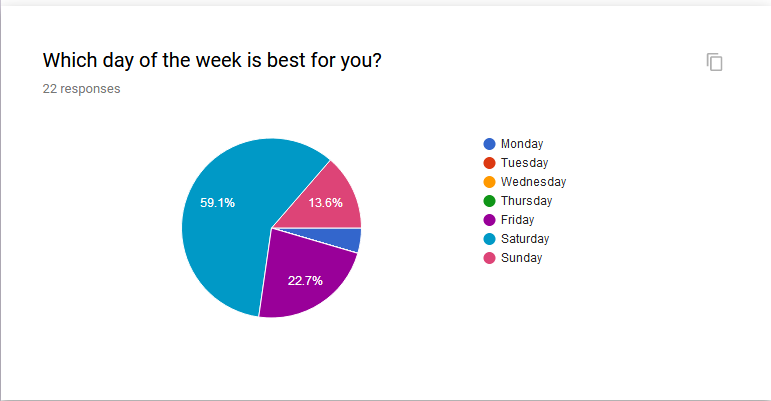 According to the survey, Saturday was the best day for 59% of respondents. Do feel free to name these people and I'll take it into consideration. reconsider those format changes, shaman. - does not make it easier to determine who to play next. - Team may end up playing each other more than reasonable. - games may cycle for some quicker than others, 3 for one 1 for others. - i think a RR or 2xelim works well, because can see who to play next and carry on, if both available. Personally im a fan of 2Xelim, but the draw need to be created by seed. so best vs worst, 2nd best vs 2ndworse etc, then the 2worse losses play each other, to struggle to stay in... etc. after a few rounds u get less games, less confusion , less pointless games, and hopefully faster cycles. Also, this creates a structure for the final rounds directly. How so? You have a group of people who have similar score. First round half and half. Pairing winners with winners this gives us a very easy to determine method of deciding who plays who and saves on decision cycles. This has a faster cycle timing than the original format. I highly doubt anyone will get 3 rounds ahead because they're still semi-bound to other people's rounds as only people who have the same score may play other people with similar score. This can/should be negated with my tools that should be bestowed on me during the tournament along with new management style. I'll also not be streaming the tournament and instead be focusing on management aspect this time. can i just collect my silver coin\cup now? I think first announcing a tourney at the beginning of the weekend before (ie ~8 days notice instead of 20) could help participation. when the announcement is shortly after the previous tourney there's some sort of burnout that makes people reluctant to sign up again. people don't want to tie themselves up so long in advance so they wait, and forget over time. people get discouraged when they see the thread hanging for a long time without any signups.